Students at the University of Waterloo (UW) have committed their time to helping the environment and making their campus less plastic. “It’s important to practice what we preach,” said Allison Bawden, a prominent member of the Ban the Bottle coalition. The coalition was formed by pre-existing clubs on the campus, Students of the Water Institute — Graduate Section (SWIGS), Waterloo Public Interest Research Group’s (WPIRG) action group Bring Your Own Bottle (BYOB), University of Waterloo Sustainability Project (UWSP) and other students who were interest in the cause but held no affiliation with any of these groups. The aim of this coalition is to reduce, and ultimately ban, water bottles from the UW campus. While they have been successful in the initial steps, including giving out free reusable water bottles, the coalition has also faced, and is still facing some obstacles. “[The university said they] will continue to sell water bottles un- til the demand on campus is zero,” Bawden stated. Water bottles are sold by all the food services, retail outlets and in- dependent coffee and donut shops. The food services director at UW, Lee Elkas, was unavailable for comment. According to the coalition, other upper administrators, including the director of retail services, were more in favour. “We think that the demand is never going to be zero,” Bawden expressed. However, the students believe that with the right proposed blueprints to achieving the successful elimination of water bottles, the demand will decline naturally. “It is more of a complex issue than just one solution; what we want to do is have a five-year plan, or how ever long it is going to take,” Bawden added. “What we hope to show is that, if the majority of students are in favour of this, I think it would take banning the bottles just to make them change their habits,” said Lizanne Pharand, another member of the coalition. Other institutions across Ontario have implemented a non-bottle policy on their campus, including the University of Toronto and Trent University. The coalition members also expressed their interest and ideas in forming a tri-union with Wilfrid Laurier University and the University of Guelph that would work to ultimately ban the bottles on all campuses. “It’s a possibility,” considered Dan Dawson, assistance vice-president of student services at Laurier, in regards to the union. Laurier has numerous water filters located around campus that provide the students with accessible areas for refilling their water bottles. 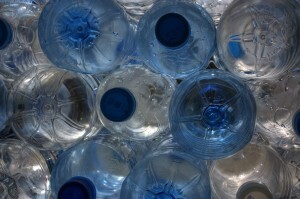 “I fully support reducing the availability of bottled water. I’m personally not convinced yet we’ve got enough evidence that we should ban bottled water,” expressed Dawson. At Laurier, the EcoHawks, a campus club devoted to environmentalism, “encourages our customers to choose wisely and make them aware of how responsible use is beneficial,” said Dawson. Curk noted that Susie Turner, the internal affairs executive, heads the iniative, named Plastic Water Bottle Phase Out Plan. While Laurier is not looking to ban bottles immediately, it is a viable possibility that discussions will be taking place.